Click on the links below to see more details. 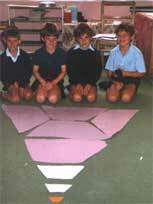 An example of a group response to the challenge of creating exactly a dragon described in drama. There are a variety of ways of fixing concepts in the memory. Drama involves the each of the above componants. Adding these elements will help in the learning of any subject including maths. I was an infant head teacher for many years. I had qualifications in educational drama and when I took a Diploma in Mathematical Education I was particularly concerned to explore the combination of drama and maths. For example, if you want children to count in twos. threes. etc. don't just give them workcards or written exercises, however visual, cut out some lilly-pads and number them in big clear numbers and make simple frog masks; ( if that is difficult a circlet with frog on will do..) Set up a route across the "pond" and off you go. Don't forget to give the frogs a back story, names etc. Perhaps there is a shark in the pond or perhaps they have been invited to meet a princess. You could follow up with "Frog Fun", a "Story Inspiration" available in the Scribing section of this site. Children get so interested in the characterisation that they will start to investigate number patterns on their own, often with results that are beyond expectation. I include a "Frog investigation" that would be fun for a class group to explore with the teacher as a story. While I was working with 7 year olds, the school celebrated its silver anniversery. I planned a maths drama project for them. One day, one of my children "found" a letter in a fancy silver envelope on the way to school. It was from a dragon called Quaha, who lived under the school. She wanted to help celebrate but was trapped. Could we help her. This lead to the "finding" of a series of puzzles and investigations that had to be solved in order to find a key. The puzzles involved tesselation, number operations, 2D and 3D shapes, money, in fact typical maths activities for for that age group. Open ended investigations were included and all work was undertaken collaboratively. One activity is offered as an example. Later, the class wanted to create more dragons. These were created in a drama session, exploring movement etc. Each group wrote a description of their dragon. Then I told them that they could draw their dragons, They cut lengths of paper for each part of their bodies and then had to draw and paint the dragons as they had described. The group whose dragon's body was as long as the field started to realise they had problems! This lead to the need to look at scale and we used a simple one to ten scale. Even so, some of the dragons turned out a very stange shape. The enthusiasm and willingness to explore mathematical concepts throughout the project was marked. The emphasis on collaboration and imagination encouraged the less able chilsdren and brought out the best in the most able. There was a lot more to this Maths adventure. All I can say is that we ran out of time, not ideas or enthusiasm. This is just one example of maths and drama working together.